For Thanksgiving this year we are headed to Australia. I enjoyed sharing our days in Greece with a travel journal so much, I’ve decided to do it again for Australia. This trip is much shorter than or other trip, but jammed packed. Our itinerary is going to be intense so I don’t necessarily recommend going at the same pace when you head to Australia. We really needed an entire extra day in Whitsundays and Sydney. Day 1: We flew into Sydney from Los Angeles, this was a little over 14 hours and we’ve experienced 19 hour time change. We’ve flown internationally a lot at this point, so I have some tips for flying overnight with kids. As soon as we landed, we immediately had to catch a flight to the Whitsunday Islands in Queensland to kick of our adventure. Customs is fairly easy in Sydney, but if you are catching a domestic flight that can be a bit tricky to change terminals. When you come out of customs you need to walk out of the international terminal and look for the T bus, not to be confused with the T1 bus. The T bus will take you to the domestic terminal. Do not panic when it takes a while to get to the other terminal, it took us 15 – 20 minutes. At the domestic terminal you will have to go through security again. Australia is kind of funny about aerosols. You will need to take them out of your liquid bag so they can run through separately. Why, I don’t know. But taking them out will save time and hassle. Once we arrived at Proserpine we took a bus into town that dropped us off in front of our hotel. Depending on where you are staying this could take an hour or so. It took us over an hour. Today we are staying at Discovery Parks a campground/cabin chain found in various parts of Australia. They have little cabins you can rent. Our cabin sleeps six people and has a little kitchen. In Australia it is expensive to eat out so cooking your own meals will save you quite a bit of money. I made the mistake of ordering Dominos. It was 43 Australian dollars for two tiny pizzas, garlic bread, and a small bottle of soda. Discovery Parks is super family friendly. On-site is a bounce pillow, water playground, swimming pool, hot tub, game room, playground, and more. We didn’t do anything today except hang out at the hotel. Our goal was to stay awake until sunset, which we managed to do. It’s important to try and stay awake so you can get a good night’s sleep. We went to sleep around 7:30 pm and slept until around 5:30 am. We needed to be up early for our excursions so this worked out great. Day 2: Today is an island tour with Red Cat Adventures with beach time and snorkeling. We departed from the marina in Airlie Beach and cruised down to Whitehaven Beach. 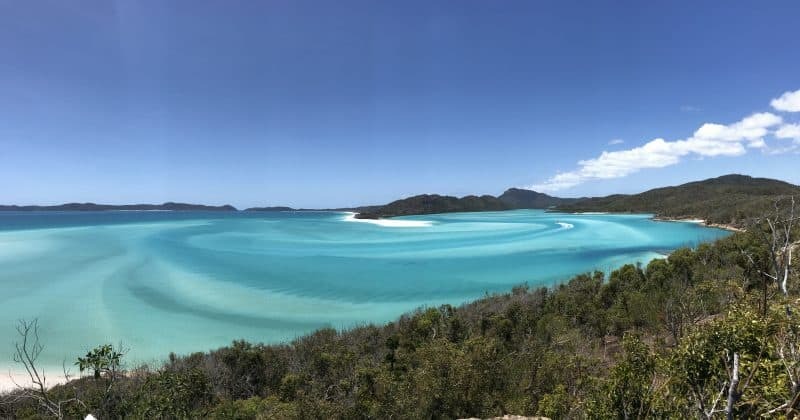 The best part of this excursion in my opinion was visiting Whitehaven Beach. It was breathtaking. Whitehaven beach is considered one of the best beaches in the world and I can easily say this was the best beach we’ve ever seen. It’s also the most beautiful place I’ve ever seen anywhere in the world. The boat drops you off on the opposite side of the island from the beach. The guide walks you up to a lookout point before you head down to the beach for a swim. From the lookout you can get epic photos. The hike up to the lookout was not easy. You climb up stairs and it’s hot. Take water with you for the hike and for your time down at the beach. There’s no shade on the beach. After spending time at Whitehaven Beach we got back on board for a buffet lunch. After lunch we visited two different places to snorkel. Both were excellent and considered fringe reefs, so not the Great Barrier Reef, but pretty darn close. There are a few important things you need to know before taking this tour. 1) They do not provide any complimentary drinks. None! You will need to bring your own. They do sell drinks for $2 Australian dollars only. They will not take any other form of currency included US money. They also will not take a credit card. Here’s our vlog from our first day in Whitsundays! After our tour we switched hotels. For the next two nights we are staying at Big4 Adventure Resort. Once again we are staying in our own little cabin. This cabin is three bedrooms and two bathrooms. Yay, for more than one bathroom! 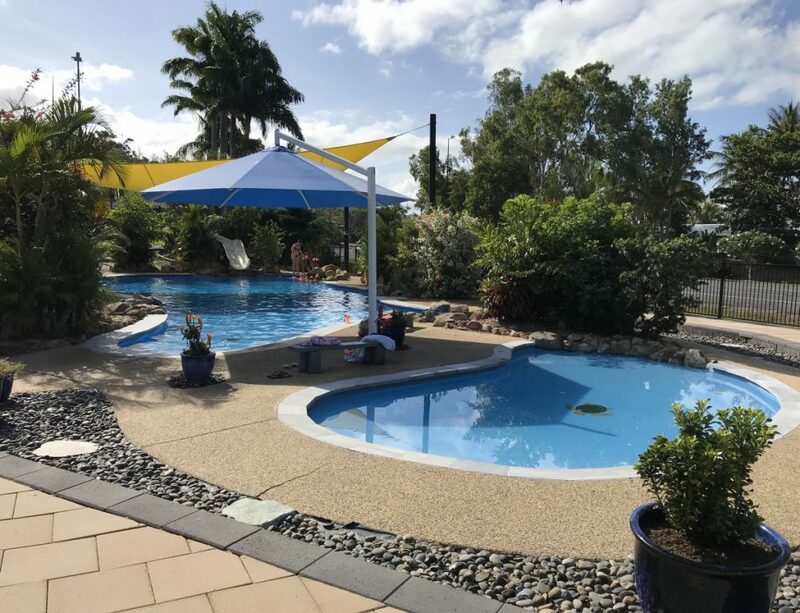 This resort has even more kid amenities including a mini water park, the largest resort pool in Airlie Beach, tennis, basketball, a playground, two bounce pillows, go carts, and more! My favorite feature was having a washer and dryer in our cabin. We did two loads of laundry! Day 3: We are doing another tour today out to the Great Barrier Reef with Explore. The Great Barrier Reef is made up of 2,900 individual reefs with over 1500 types of species and can be seen from space. It is the largest living structure on earth. The boat ride out to this part of the Great Barrier Reef is a long one. From Hamilton Island it is a two hour ride. I wish I had brought a game with us or at least some playing cards. I travel with the GOtrio. It is a travel-size version of Otrio and can be played by 3 people, which works out well since I have three kids. Once we arrived to the snorkel area we were given an extremely informative brief ranging from how to use the equipment to what kinds of fish you will see in this area. They provide all the equipment needed including a snorkel mask, flippers, stinger suits, and life jackets. They also had noodles if you prefer that. I recommend parents put their children in life jackets, even if they are excellent swimmers. The kids and I always wear life jackets in these types of situations. Because why not, being safe never looks stupid. When the kids were younger, I took an inflatable life jacket with us as we traveled around. Then, you set off to snorkel for an hour and fifteen minutes. This may sound like a really long time, but it goes by super fast. Isn’t it crazy how fast time flies when you are doing something interesting. After your first snorkel time you get back on the boat for a buffet lunch. They provided more than enough food to feed the 60 tourists on board. In the morning they had coffee, tea, hot chocolate, and water available at no cost. Also for no additional cost was the fruit, cookies, and muffins provided in the morning. After lunch you go back out for another one hour and fifteen minute snorkel. Again time flies and when you get back they have fresh fruit for you. They also open the bar once water activities conclude. Alcoholic beverages are $7 Australian dollars each. They also have soda for $3. A little bit later they put out a complimentary cheese platter. Now many of you know that my oldest child, Noah has epilepsy, so you might be wondering if I have lost my mind taking him on an activity like this. Well, a couple of things. About a week and a half before our trip I had his medication levels checked, they were excellent. Before doing the activity we talked through at length about how it would go: whole family in life jackets always together and prepared. We talk through exactly what we will do and what is important in case of seizure and what isn’t important. Now, there are two things that are the main reasons we can do this and other people or kids with epilepsy cannot. Noah doesn’t have a trigger. The motion of the water and the way sunlight comes through the water will not trigger a seizure. He also isn’t triggered by stress or physical exertion. The second main reason is Noah has a long aura. This means that he knows for 10-30 seconds that a seizure is coming. 10 seconds is enough time to execute a plan you’ve practiced and prepared for. Before you try something like this with your person with epilepsy keep all these things in mind. We also knew that we might get all the way out there and he not participate regardless of how much was paid for the activity. When we arrived out to the snorkel spot it was a go. They had three staff members in the water close by at all times. They also put him in a bright red shirt so they could keep an eye on him at all times. They also marked his snorkel. With all of this said the four of us had two successful and amazing snorkel sessions. I will be truthful though. I never relaxed, not for one second. I enjoyed it and saw many fish, but the most important thing I was looking at was my son at all times. I could also burst into tears writing this because last year in Oahu this was a no go and the year before in Thailand he couldn’t participate. Stay tuned, because there’s more to come……..
Day 4: Today we head to Melbourne where we will be hanging out with my dear friend Explore With Erin. In order for us to get there we’ve taken a taxi to the marina terminal, a Cruise Whitsundays ferry to Hamilton Island and caught a flight to Melbourne. How crazy is that! 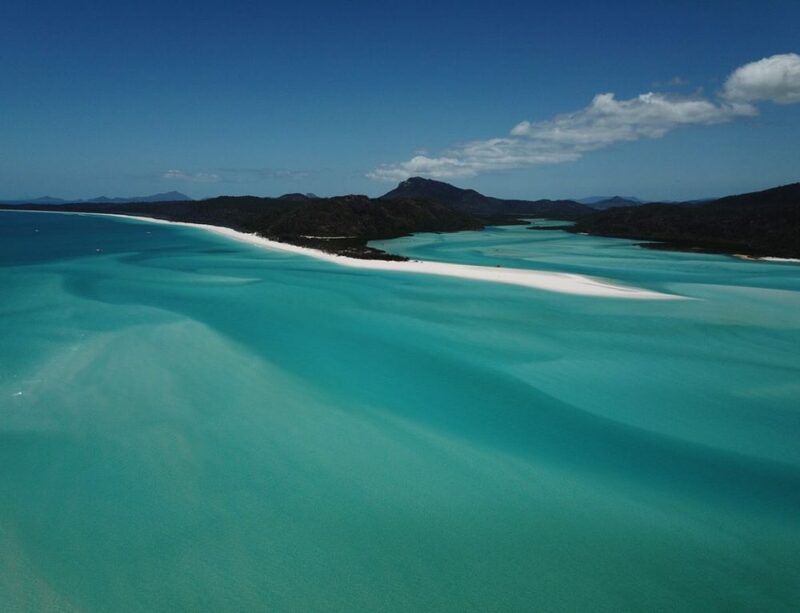 The Whitsunday area has two airports and Hamilton Island was one of them. It was quite a bit cheaper for us to fly out of here instead of Proserpine. But I think I know why, it’s because it’s a pain to get to. Oh well, another lesson learned. We’ve wised up to the various boat layouts and made sure to have some games with us on the ferry like a deck of cards or GoTrio. Tonight we went to Santa’s Magical Kingdom, where you could watch an impressive circus show, meet Santa, ride the rides, and eat. I have warned my children not to ruin the magic for Erin’s kids. They are still believers. My kids, not so much. It’s been several years since that ship sailed. Day 5: Road-trip! We are loading up the kids and headed even further south to see the 12 Apostles. Last year I saw the 12 Apostles for the first time and it totally blew my mind. I knew right then and there that I was going to come back to Australia with the kids just to show it to them. One of the best times to visit the 12 Apostles is at sunset. The sun reflects off the rocks, which makes for an amazing photo. Nearby is the Lord arc which is also quite impressive and not near as crowded. You can venture all the way down for another epic photo. Today we drove down a large part of the Great Ocean Road. We made stops at Bells Beach, Kennett River, the 12 Apostles, and then stayed the night at the Port O Call Motel. This was the same place we stayed last year. I was impressed how many things they had updated. Day 6: We are spending most of today doing more things along the Great Ocean Road. We stopped to see the Loch Ard Gorge, the Arch, the London Brings and we did the Gipson Steps. We also went to the Great Ocean Wildlife Park, here the kids got to see lots of kangaroos and feed them! On our way back to my friend’s house in Melbourne we stopped at Sweet Street Desserts and had some seriously over the top funnel cake! Day 7: Today is our last day in Melbourne and we’ve got it jammed packed with all the things we want to do. We will be seeing the Brighton Bathing Boxes and the Graffiti Walls. Hopefully along the way we will be eating lots of amazing food! We ended up eating many amazing meals in Melbourne all of which were beautiful and over the top. 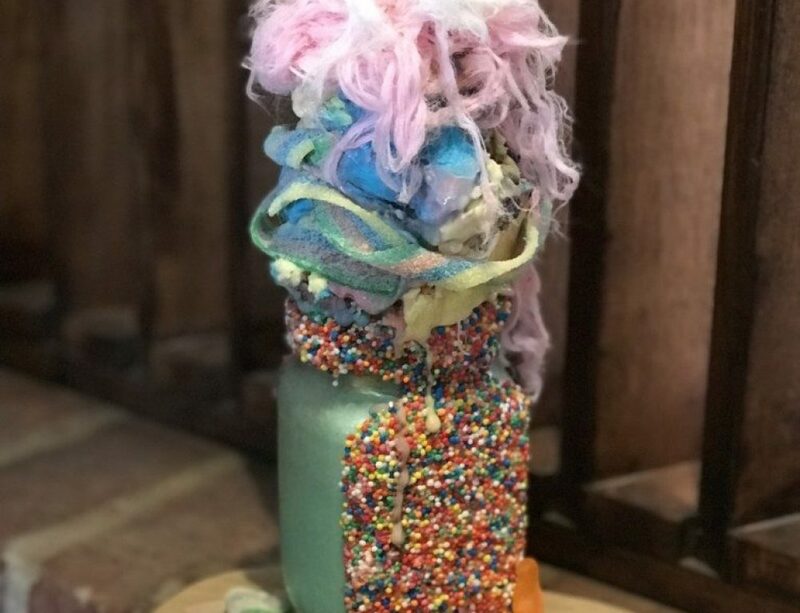 Colorful Melbourne Cafes. 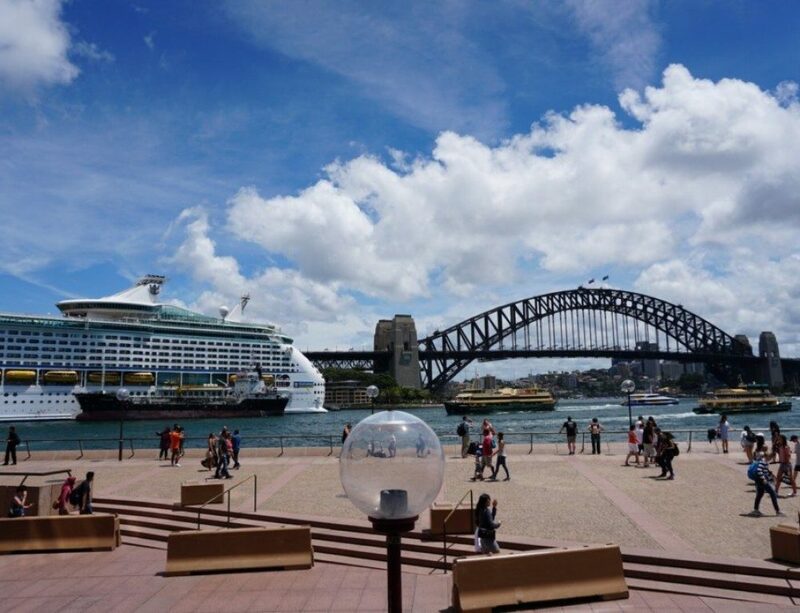 Day 8: Sydney and Homeward Bound.